The ActiveWave Standard Field Generator is a small, efficient tag wake up device. The Standard Field Generator transmits wake up commands to tags at 433 MHz. For broadcast commands, any tag within range of the Standard Field Generator will respond by transmitting its own data. For non-broadcast commands, only the specified tag(s) will respond. Along with the rest of our products, the Standard Field Generator was designed for easy setup, configuration, and use. When the Field Generator is first powered, it automatically sends a power-up message. 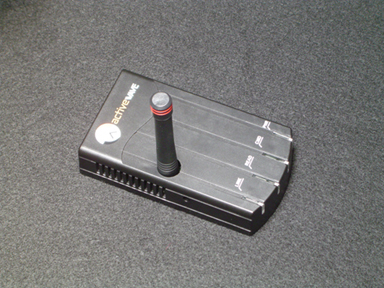 If the Host and Field Generator are connected via RS-232, then the Host will immediately display the Field Generator's address and allow the user to change it. ID - Address of the Standard Field Generator. Operating Modes - Continuous on/off period or motion triggered. The Standard Field Generator has two modes of operation. Either the Field Generator periodically turns on and calls tags for a specified time, then turns off for a specified time, or the Field Generator is activated by a motion sensor. As soon as movement is detected, any tags in the immediate vicinity are called. As an added bonus, almost any standard input device can be used to activate the Field Generator. Specific tag IDs can be awakened by the Field Generator, or specific types of tags, or all tags. The transmit range can also be adjusted to control the RF coverage area.